The Mahanay Memorial Carillon Tower, located on the southwest corner of the courtyard, was given to the people of Jefferson and Greene County in accordance with the wills of Mr. and Mrs. Floyd Mahanay. The tower is 168 ft. 2 inches high, and illuminated by 6 floodlights. The glass enclosed observation deck at 120 ft. is accessed by an elevator so is handicap accessible. This deck will be named the Paul Nally Observation Deck at the 2017 Bell Tower Festival. Since 1966, there have been 14 bells, illuminated by 3 floodlights, which were cast at the world famous Petit & Fritzen bell foundry in Holland in 1966. These 14 bells chime on the hour, quarter and half-hour. The electronic carillon bells were played from a manual keyboard. BEcause of the limited amount of music that could be played with only 14 bells, recorded concerts played two songs after each hour for many years. The total cost of the tower and the 14 bells dedicated on Sunday, October 16, 1966 was approximately $350,000. In 1980, a group of volunteers organized the first Bell Tower Festival centered around what everyone called The Mahanay Bell Tower. 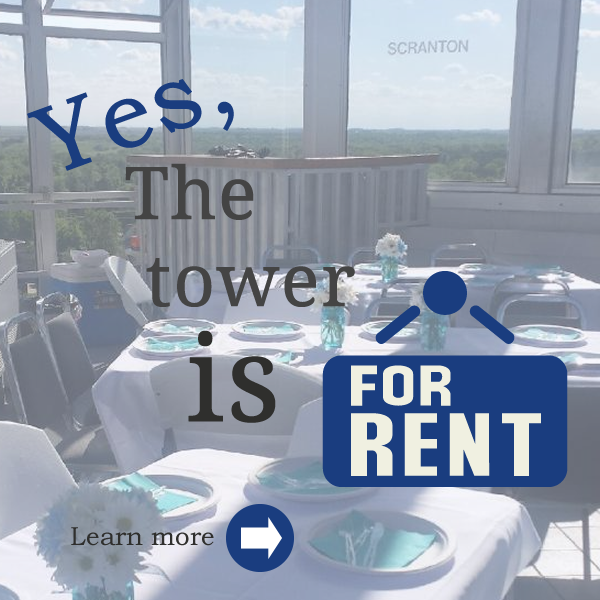 In 1983, a Bell Tower Community Foundation was established with the goal of enhancements to the tower, hiring tower staff and marketing the tower. In the early 1990’s a campaign for a four octave carillon fell short with only 15 bells of the fourth octave purchased by donors. These bells were placed in a display case in the Greene County Courthouse. For the 50th Anniversary of the tower in 2016, a new “Let the Bells Ring” campaign was kicked off with the gift from Paul Nally’s estate, Grow Greene County Gaming Corporation’s grant of $61,500, individual and family donors for bells, and award of Vision Iowa grant funds. This moved the campaign to the $440,000 level needed to add the additional 18 new bells to the 15 bells already purchased in the early 1990’s. Finally a four octave carillon of 47 bells was in sight. The Verdin Company of Cincinnati, Ohio was the company involved in producing the original 14 bells so were contacted to work on this project. In August of 2016, 9 bells were removed from the tower to take to the Verdin Company in Ohio for repair to the strikers. The remaining 5 bells were repaired on the structure so the Westminster chimes could continue to be played. Eighteen bells were cast at the Petit & Fritzen bell foundry in Holland. All bells were fitted with strikers and engraved with the names of the donors. On May 25, 2017, the bells returned to Jefferson and the process of hoisting the bells to the roof began. Daily Tower Tunes Live concerts at 12:15 – 12:30 pm started at the 2017 Bell Tower Festival. Rick Morain was the first musician to play the bells at 6:15 pm on June 9 and again at 3:15 pm on June 10. The daily 12:15 concerts feature local musicians, guests from around the area and musicians returning to the community. These start on Memorial Day weekend and continue Labor Day weekend. A list of the musician playing is posted outside of the Tower.